When did that happen? It seems that without anyone noticing, the struggling cryptocurrency Ethereum reclaimed its title as the second most valuable crypto on the market. Whichever way you throw it, 2018 was a desperate year for Ethereum fans. Apart from a jubilant January with ether trading at over $1,300, the world’s second most popular crypto went from bad to worse. Why Did Ethereum Fall in 2018? Co-founder of Ethereum and ConsenSys Head Joseph Lubin brushed the price plummet off as a speculative bubble, explaining that the crypto world had already been through six similar ones before. Other critics said that the collapse of ETH $148.929 -0.59% was inevitable and that its value would eventually go to zero. The blockchain’s scalability issues and ICO dumping were also cited as major causes–not to mention Ethereum whales swiping their tails and making the markets move. But, things move fast in this industry, and all of that was so last year. 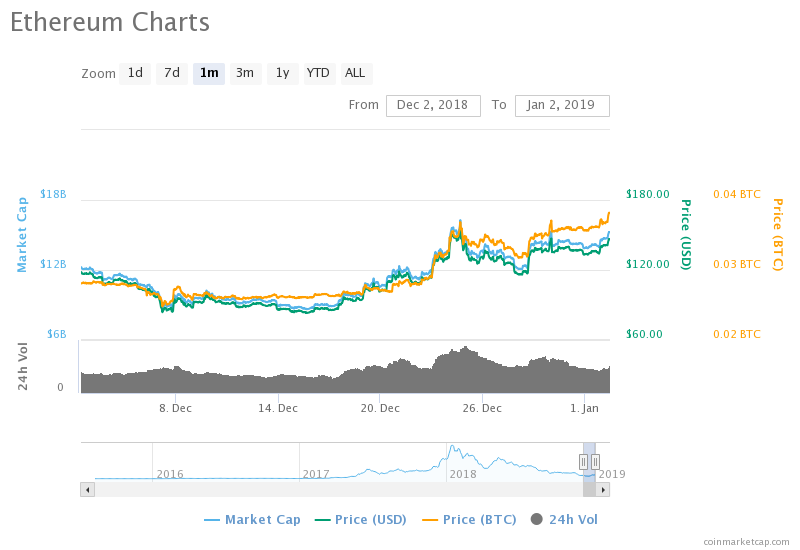 It’s great news for downtrodden ether fans today as the currency regains its second place slot with a massive 80 percent increase over the last 30 days–from $83 to $150. Ethereum has reclaimed its place as the second most valuable cryptocurrency in the market. And who would have called it? Does this mean that the next Bullrun on its way? For many, that would be premature. Those quick to criticize the altcoin are already brushing the pump off to the upcoming fork, and say to beware of buying in now. Ethereum fork coming up soon makes it worth being very cautious with any bearish bias. Still trading what I see on the charts but if ETH decides to go on a run then I'd have to think the rest of the market would follow to some extent. Others say that it won’t be too long before another ICO dump restores things to the way they were. But whatever happens from now for Ethereum, let its fans enjoy the moment. ETH is back where it belongs as the most important altcoin, and they can savor that for now. Will Ethereum lock in the number two spot in 2019? Share your prediction below! Next Post'Normally people would be pulling their hair out': How are Bitcoin backers handling the crash?